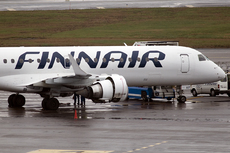 Finnair flight AY1550 was forced to go around while on approach to runway 15 at Helsinki-Vantaa Airport, Finland. The aircraft, an Embraer ERJ-190LR (OH-LKF), had been cleared to land when a Jetflite Bombardier Challenger 604 (OH-WIC) inadvertently taxied onto the active runway. AY1550 was about 2 kilometers from touchdown and performed a go around. A safe landing was carried out at 11:05 LT.
During this incident the weather was snowy and windy and only one runway was in use. The ATC noticed the runway incursion from the ground control radar display and ordered the aircraft to stop immediately. The aircraft turned around and vacated the runway approximately one minute after the incursion occurred. The ATC ordered the approaching airliner to go around. As it passed above the occurrence site the business jet that had made the runway incursion had already vacated the runway strip. The business jet had been standing outside in the snow for approximately two hours because the take-off time had been delayed for reasons independent of the operator. The cockpit windows were covered with snow and were frozen over; they were not cleaned before taxiing. Even though cockpit heating kept the windshield thawed, the side windows had become covered with snow and ice. The flight crew started going through the before take-off checklist as soon as they started taxiing. Owing to the limited visibility and focusing their attention on the instruments the pilots passed the taxiway junction without noticing it. In the blowing snow they passed the stop bar and, instead of turning onto a taxiway, entered the active runway.